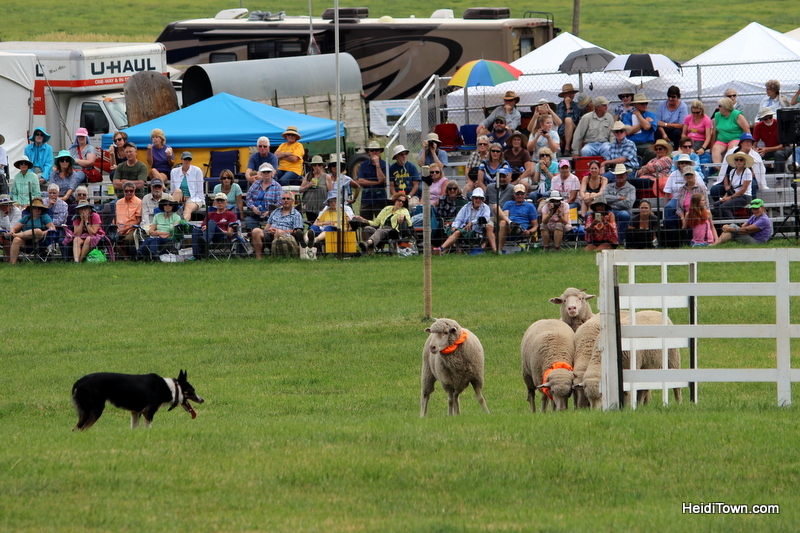 If you think sheepdog trials involve dogs chasing sheep around, you’d be a little right, but not entirely right. 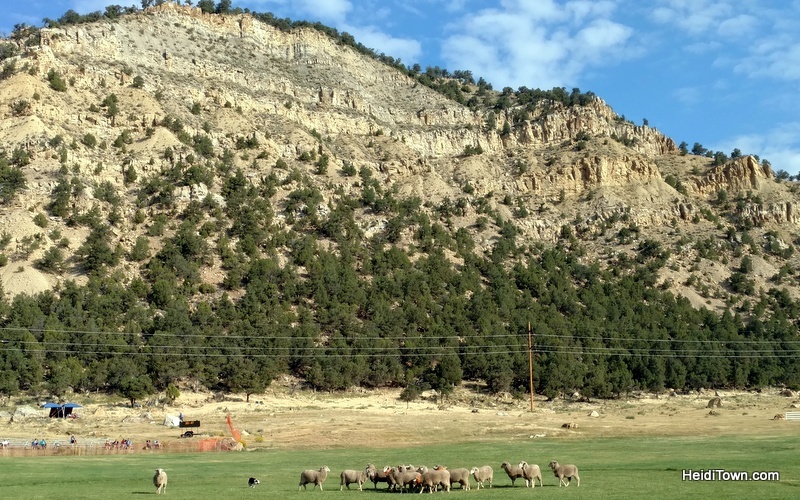 Sheepdog trials are much more involved than I ever realized and our weekend trip to Meeker, in Northwest Colorado, was an eye opening experience. I liked it so much that I’m hoping to sponsor a dog/handler team in 2018. When I set out on this trip, I didn’t really intend to write specifically about the sheepdog trials, after all, I was there to judge and help promote the Jammin’ Lamb Festival, a lamb cook off in downtown. However, after watching the competition, I really wanted to write about it. 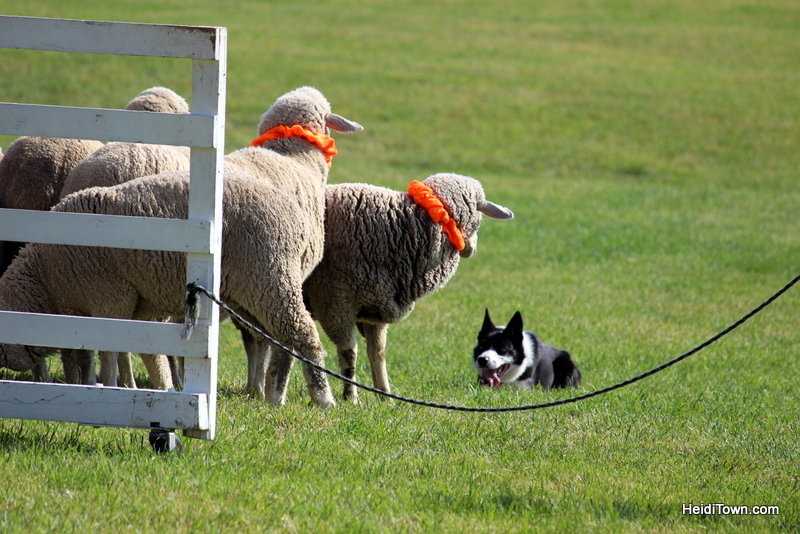 So what are sheepdog trials? In a nutshell, it’s a competitive sport in which herding dogs, under the command of their handler, move sheep around a large field, through fences and gates and into enclosures. The sport is mimicking the work that many of these dogs do at home on the ranch, although some of these dogs spend most of their time competing. For a complete history of dog trails, go here. The trials in Meeker have been occurring for 31 years, and this is a serious business with $22,500 in prize money at stake this year. The organizers hosted 130 dog/handler teams in Meeker this year and, as always, the public is welcomed to attend. This five-day event features three days of preliminaries with a semifinal on Saturday and a final on Sunday. In addition to the trials, which start at 7 am and go all day with a break for lunch, there are lots of other things on the agenda too. We arrived on Saturday to a sea of tents and were greeted by the smell of fair food, one of my favorite scents. 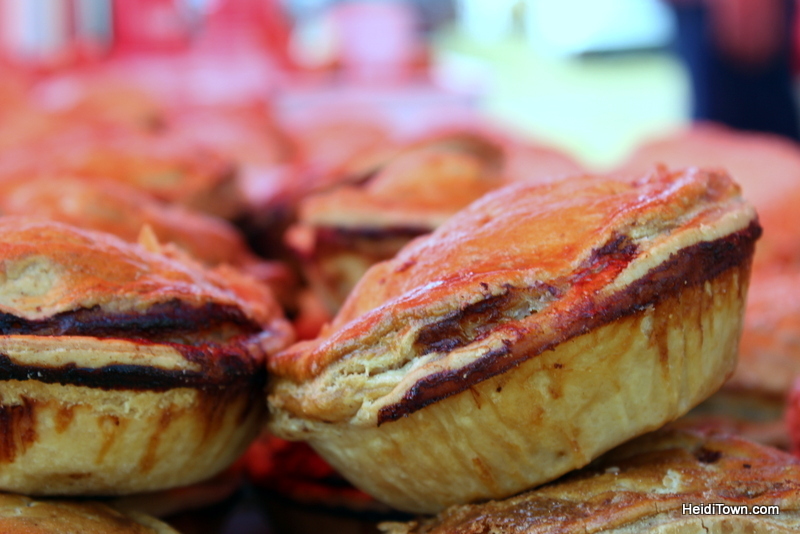 For lunch, we ended up wolfing down delicious meat pies from an Aspen pastry vendor, but we could have picked from a variety of delicious foodstuff including barbequed ribs or Navajo tacos. We made our way to a bleacher seat where we sat, alongside a couple of handlers and their dogs, and watched several teams run the course. As an aside, I loved watching the handlers interact with their dogs off the field of competition. There’s a lot of love in these partnerships. Who says you can’t be a working dog AND a lap dog? The more we watched over the course of the day, the more we grasped the nuances of the sport. Each dog and handler seem to have a little different style; for instance, some handlers talk to their dogs a lot, while others only communicate via the whistle, and even the dogs have differing styles. During a Lie Down command some dogs actually lie down in the grass, becoming just a pair of ears above the green, but other dogs simply stop in their tracks and resemble a border collie statue with a pink, lollygagging tongue. Sometimes you get an uncooperative sheep. We saw more than one of these bullheaded ewes on Saturday. It’s no secret that I’m a dog person. I grew up with German Shepherds and currently own a 14 ½-year-old spoiled female GSD. I am a huge fan of working breeds because I love their intelligence. I’ve always admired border collies and would love to own one when I have enough property to let them run. 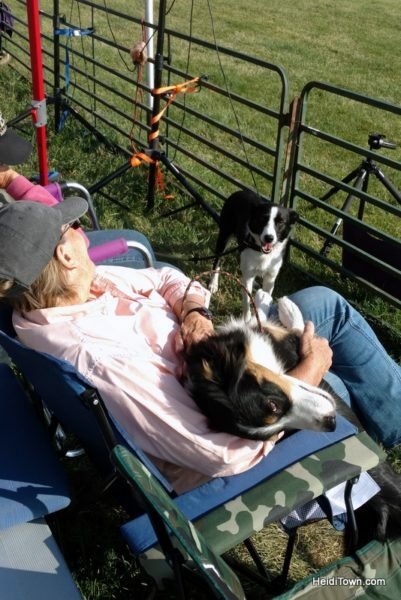 I wrote the preceding paragraph to explain that while the sheepdog trials are interesting, I think that dog people may find them more entertaining than non-dog people. In addition to the competition, there’s other stuff on the Meeker Sheepdog Trial agenda. As I’ve already mentioned, there’s a good number of food vendors selling a variety of different menu items. 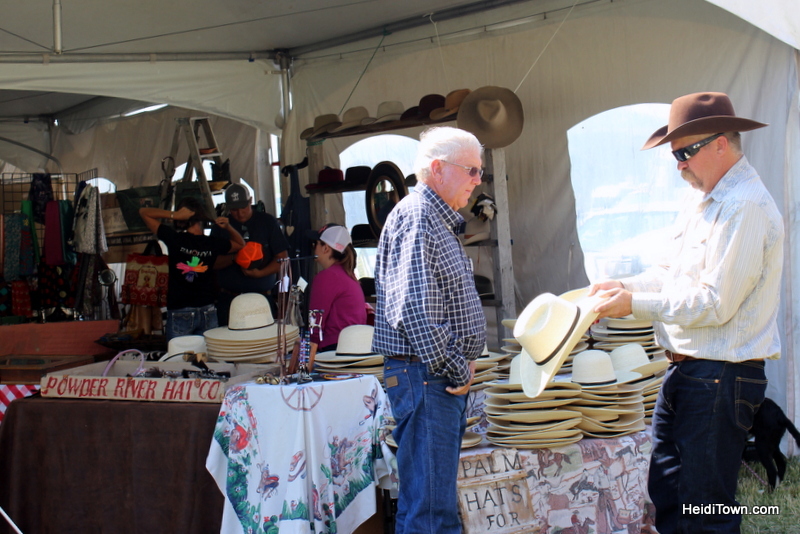 There’s also a big tent where local artisans sell their wares; everything from saddles to handmade jewelry and soap. The education tent features events like the Blanco Cellars & Little Cheese Shop from Meeker serving up free sheep cheese and many demonstrations and presentations themed around the event (think sniffer dogs and vet presentations). This is Buster. 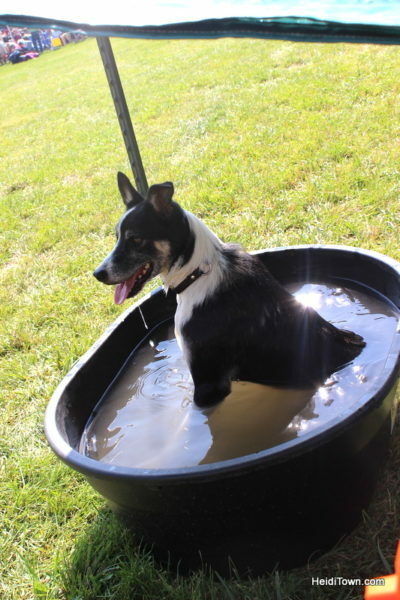 Like all the other dog competitors, he loves his soak in a cool bath after his run. If you love border collies, this is the place to come. Not only was their sheep and border collie art all over the stores in downtown Meeker, but the Sheepdog Trials features an array of vendors selling border collie merchandise including t-shirts, blankets and everything in between. If you’ve got kids, bring them. There’s a petting zoo, and this year, they had Fly Ball demonstrations that were a hoot. Your little ones may not last all day, but I know I would have been fascinated with the Meeker Sheepdog Trials as a kid, especially as a kid that loved animals. I learned that Fly Ball is fast and very loud. Once you start watching the trials, I mean, really watching, it’s addictive. You start rooting for the handlers and their dogs and sometimes it gets downright tense. 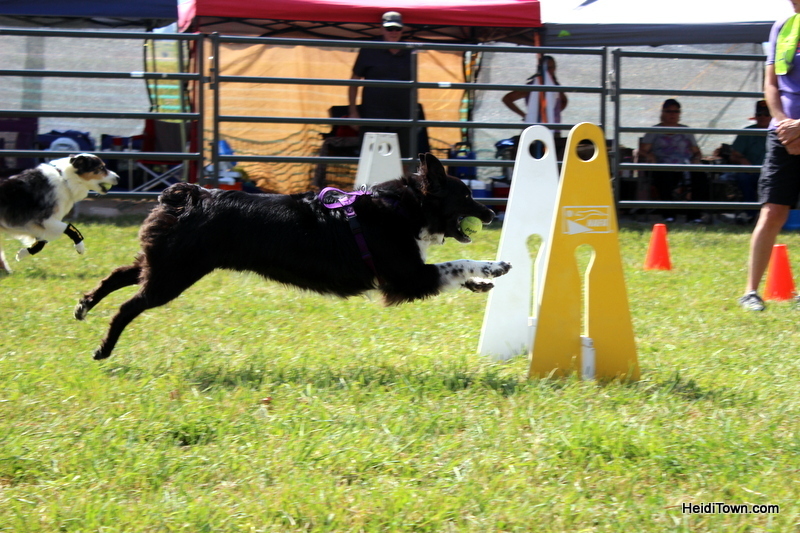 We hadn’t planned to return on Sunday because we needed to get home to our old dog, but we did end up returning to the event grounds to catch one of the runs on the final day of competition. This is when the top 12 compete and the dogs have to herd 20 sheep instead of five. The final day’s course is also a bit different from the first four days. That’s a lot of sheep! Sunday’s finals. We enjoyed the competition, the beautiful views of the surrounding countryside, the echoes of the bagpipe, the smell of fair food and fresh grass and the speed of Meeker. Time moves just a little slower here and people are just a little friendlier. The Meeker Sheepdog Trials are a great excuse to visit this little throwback town where the sheep and kids still roam free. 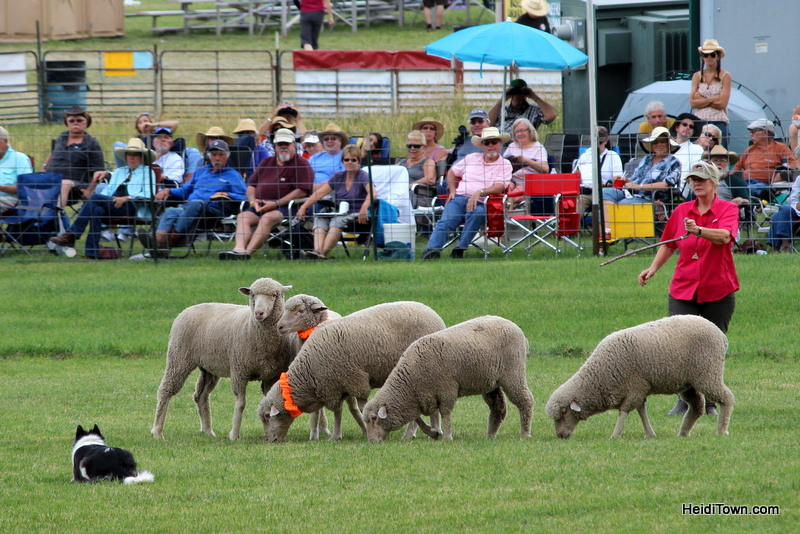 The Meeker Sheepdog Trials are held annually in September in Meeker, Colorado, about 3 ½ hours west of Denver. If you want to go, plan ahead because lodging in the town fills up well in advance of the event. Go to MeekerSheepdog.com to start planning your visit.